A range of Optoelectronic and Switching Anemometers is available with various different output signals and power requirements making them suitable for a wide range of applications, including Meteorology, Wind Assessment and Offshore, where accuracy and sensitivity are important. A100 Series Anemometers are available with an optional MEASNET/IEC Calibration Certificate if required. Several types of Windvane are available for use with our range of anemometers or for use alone, including Potentiometric and Self-referencing types. The premium quality W200P windvane is a popular & durable choice for demanding Wind Assessment applications, having "First Class" performance to meet the requirements of the IEC61400-12-1 standard. First Class W200P/FC windvanes with larger vane/fin, higher max windspeed rating, and 10K pot are now available. W200P windvanes are now available with an optional MEASNET/IEC Calibration Certificate if required. + 6M (19 ft 8 ins) Cable + CJK1 Cable Joint Kit. We offer a Repair/Refurbishment service for the instruments we manufacture, we also offer a Recalibration Service for our A100 Series Anemometers. Please enquire. Our factory aims to achieve a repaired/refurbished anemometer which performs "as new". Anemometers are completely stripped-down, electronics tested/adjusted as necessary, re-used parts are cleaned, then the anemometer is rebuilt using a brand-new bearings/spindle set and cable. Rotors are completely rebuilt with new cups and locking mechanism. Similar procedures are applied to windvanes. Having access to all original parts and test equipment means that the results of our Factory repair/refurbishment work is superior to the "field repairs" that others may offer. Using our Factory Repair/Refurbishment services ensures that the value of your investment in Vector Instruments sensors is maximized by way of continued high-performance and accuracy over many years, and over many measurement campaigns/deployments at different sites. Many dataloggers, including Campbell Scientific loggers, NRG loggers (Symphonie) and Secondwind loggers (Nomad 2), are compatible with our wind/weather instruments and together form very capable Automatic Weather Stations (AWS) suitable for many applications, including wind assessment. We also manufacture a miniature solar radiation shield, type T351, and a selection of compatible probes for air temperature measurement. Also available is the T302 UK Met Office pattern precision aspirated air temperature sensor. The T351-HMP110 version of our T351 miniature shield/screen is now available - This model is fitted with a high quality HMP110 Relative Humidity & Temperature sensor and provides voltage output signals for RH and Temperature suitable for connection to most dataloggers. 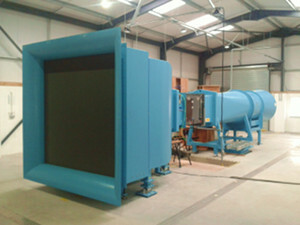 These weather instruments, initially designed at the Chemical Defence Establishment at Porton Down in the UK during the 1960s, have been manufactured and improved by Vector Instruments since 1972 with a range of instruments for different purposes being available today. Several sensors for measuring the Relative Humidity of the air are available, including our T351-HMP110 voltage output RH&T sensor with screen/shield. 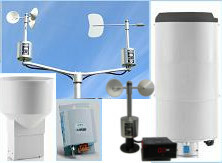 Wind Displays, 4-20mA, Barometers, Rain & Other sensors..
A range of Wind Indicators/alarms, 4-20mA converters, Barometers (Atmostpheric Pressure Sensors), Rain Gauges (Pluviometers), Surface-Wetness/Frost and Other Weather Sensors are also available. Our Anemometers and Windvanes can now be fitted with the new /HE-4 internal anti-icing heater option to help alleviate problems due to icing conditions. Because the /HE-4 heater is fitted inside the instrument, anti-icing effectiveness is improved, NO extra cables are required, and there is NO change to the instrument shape, dimensions or appearance meaning that optimum performance and accuracy is maintained. Vector Instruments (V.I.) specialise in the manufacture and sale of quality, robust, professional wind speed and wind direction measuring equipment together with other weather sensors and associated equipment. Our products are available for sale to Trade, Business, Government and Educational customers (B2B sales). Vector Instruments is a trading name of Windspeed Ltd. Vector Instruments have been developing and producing anemometers and windvanes in North wales, UK since 1972 and was only recently reorganised into a limited company, Windspeed Limited and continues to produce instruments under the Vector Instruments brand/trade name. Recognised for many years as a leading name in the field of wind instrumentation for scientific research, Vector Instruments sensors have steadily found new uses in environmental monitoring, alternative energy, utility, and industrial applications. For this wider market, the range of wind sensors has been extended to include several new versions featuring different transducer types, outputs and other features optimised for specific applications. V.I. policy is one of continuous improvement of the whole product range, with periodic updating of specifications, while maintaining compatibility with superseded products wherever possible. New sensor designs undergo a thorough program of laboratory tests and field trials before release. Besides the established range of wind speed and wind direction instruments, V.I. have for many years produced specialist temperature sensors; these include the T351 naturally ventilated mini-screen in versions accepting several types of sensing element, an aspirated temperature sensor (T302) made to a UK Met Office design, and the H301 wet and dry bulb psychrometer. Page Rendered in: 0.260787 seconds. - Powered by Mambo.